Trained, poised and ready, Ventura County Sheriff’s Sgt. Ron Helus responded to the mass shooting Wednesday night at Borderline Bar—and made the ultimate sacrifice. Helus, a 29-year veteran of the department, is being hailed a hero today for charging into the restaurant first in an attempt by law enforcement to stop the shooter and save lives. He paid for his actions with his own life. Helus, 54, was working a nearby traffic stop when he heard the call of “shots fired” at 11:20 p.m. Tuesday. Arriving on scene, Helus heard gunfire from inside the bar where some 175 students were celebrating College Country Night. 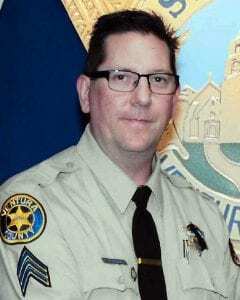 He and a California Highway Patrol officer entered through the front door Helus was struck multiple times by gunfire from the Glock .45-caliber handgun wielded by shooter Ian Long, Dean said. A California Highway Patrol officer pulled Helus out of the line of fire. He was transported to Los Robles Regional Medical Center where he later died from his injuries. Helus, a Moorpark resident, is survived by his wife, Karen, and his son, Jordan. An avid outdoorsman who loved to camp and fish, Helus was planning to retire next year. Those who knew and worked with Helus said his heroic actions mirrored who he was: a dedicated and selfless sergeant who loved his job, his family and his community. “I’ve known Ron 25 years. He was my first field training officer,” said Senior Dep. Amy Ward, who worked with Helus at the Thousand Oaks Police Department for two decades. During his 29 years with the department, Helus worked narcotics, was a member of the SWAT team and served as an instructor for other deputies. Ward said that when she was working in the station’s traffic bureau, Helus served as her backup at every stop she made. “He was the type of sergeant that truly loved his troops and backed his troops,” she said. In addition to his work with the department, Helus owned a business called Gun Control, which specialized in firearms training and concealed carry permits. He was a graduate of the University of Oklahoma. Facebook photos show him hiking in the mountains and fishing in small streams.